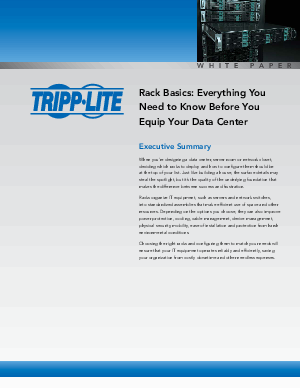 When you’re designing a data center, server room or network closet, deciding which racks to deploy and how to configure them should be at the top of your list. Just like building a house, the surface details may steal the spotlight, but it’s the quality of the underlying foundation that makes the difference between success and frustration. Racks organize IT equipment, such as servers and network switches, into standardized assemblies that make efficient use of space and other resources. Depending on the options you choose, they can also improve power protection, cooling, cable management, device management, physical security, mobility, ease of installation and protection from harsh environmental conditions. Choosing the right racks and configuring them to match your needs will ensure that your IT equipment operates reliably and efficiently, saving your organization from costly downtime and other needless expenses.